Sachin Tendulkar is arguably the greatest cricketer to have played the sport with fans across the globe singing his praises even years after the Indian legend has bid farewell to the sport. Many of his records – like the feat of 100 international centuries – might remain unbroken for a pretty long time and very few cricketers come close to matching his greatness. Sir Issac Vivian Richards certainly counts among them though and the West Indies legend, who was way ahead of his time as an aggressive batsman, revealed the mutual admiration and respect he shares with Tendulkar. Speaking in the latest episode of the popular cricket chat show “What The Duck”, Viv Richards spoke about the conversation he had with the “Little Master”, or as the West Indian legend would call him, “The Shaolin Master,” when Tendulkar was going through a rough patch at the international level. From his early days as an aggressive batsman who loved to take the attack to the opposition, Tendulkar transformed himself to a calm and composed batsman who took on the responsibility of guiding the team to a steady start as the likes of Virender Sehwag and Yuvraj Singh came on to the scene. But it was not a move that thrilled the die-hard fans of Tendulkar who wanted their idol to tear apart the opposition bowling attack. It was at that time that Tendulkar gave a call to Richards to help him address the concerns he was having mentally and the latter was more than happy to help. Richards advised Tendulkar to let go of the pressure that the Indian fans were putting on him and wanted him to take on the new role. He also asked Tendulkar to relax and enjoy his batting like the way he used to with the ball whenever he was called upon. Looking back, Richards’ words certainly seemed to have done the trick as Tendulkar got better with age and eventually fulfilled his long-cherished dream of winning the ODI World Cup when India defeated Sri Lanka in the final of the 2011 World Cup in his hometown Mumbai. Cricketers from the Carribean are known to be music lovers with the Calypso beat a part and parcel of their life and Richards was no different. 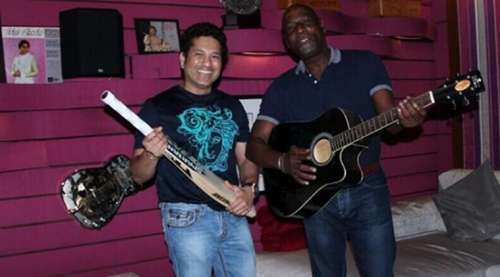 The 65-year-old spoke of the bond he shared with Tendulkar in music and revealed that they had a lot of shared interests. The likes of Bob Marley, Elton John, Mick Jagger and Eric Clapton featured regularly in their chats and as the host of the chat show pointed out, Richards was one of the very few allowed access by Tendulkar to the music room at his residence – a place he considered very sacred.